Over the last few years, Pune has recorded a slight elevation in real estate sector. It is one of the growing cities of Maharashtra and is a home for most of the leading IT companies. The city has seen enormous growth in real estate market and is still budding at a good rate. Let’s take a look at few factors which will throw light on the current situation of Pune for real estate developers as well as for home buyers. Because of its closeness to Mumbai and also due to lower cost of operation, Pune is one of the most developing cities of Maharashtra. Rising education centres and IT hubs has made this city a prominent area for real estate developers. Pune is the only city which enjoyed a steady development in 2015 and has shown double digit appreciation in the last two years. Although, investors are still waiting for the market to rise, as expected return is less than cost of fund, but it is a good opportunity for home seekers to buy a home in Pune. Pune has witnessed a steady growth of IT industries in all corners of the city, which has made people from different cities to come and settle down here. This tremendous increase in city population is attracting several real estate investors and is responsible for their mushrooming growth. The effect of IT companies has ramped up real estate market in Pune and many developers have started building residential properties even in the outskirts which is a common trend in 2015. So, Pune is no longer a city of pensioners, it is a home of many IT companies and organized retail stores which has changed the demographics of city. Thus, we can say thatthe city has experienced its infrastructure extension in 2015. This ever increasing population of Pune is demanding availability of land, which ultimately results in expansion and development of peripheral localities. Year 2015 has followed a trend of saving a sizeable amount and purchasing a house that fits in pocket. This has made real estate developers to cater properties which basic requirements and specifications in a limited unit size. Most of the people prefer areas which are near to their workplace. Hinjewadi is a major IT hub comprising of most of the multinational companies. With the growing demand of residential areas near Hinjewadi, places like Wakad, Baner and Aundh have gained popularity because of their immediacy to Hinjewadi. Most of the real estate developers are focusing on integrated township concept in surrounding areas for satisfying the demand of residential properties. 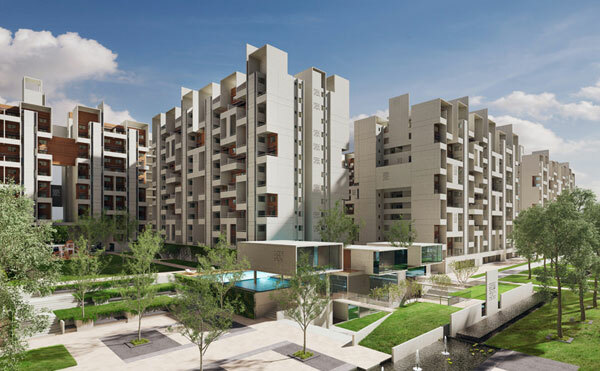 Real estate biggies like Godrej have showed their interest in Pune for developing a township named Godrej Infinity in partnership with two other companies. The complete project of Godrej is spread in 43 acres of land with a saleable area ofabout 3.2 million sq.ft. It is a joint venture of Godrej Properties, Oxford Group and Ekta World. Apart from this township plan there are ample of projects in 2015 which have been launched and grabbing attention of buyers. The main aim of such type of constructions is to render affordable, self-sufficient, fully equipped flats to middle class people. Pune is enjoying a heavy demand of 46,000 which was around 20,000 units 15 years back. Although, Pune has been enjoying good appreciation from the last few years, still there are some areas in the city which have exceeded average capital value appreciation rate. The main reason behind this is the emergence of IT sector in the vicinity of these areas or their proximity to central business district. Let’s have a look on some places which comes under highly recommended area of Pune. This South-Eastern sub market has earned attention of real estate developers because of IT sectors in Viman Nagar, Kharadi and Nagar Road. All these places are near to Wagholi and are enclosed with many IT parks like Eon, Tech Park One, Weikfield IT Park, Giga Space, RahejaCommerzone and Kumar Cerebrum etc. These IT sectors have given employment to most of the people and thus demand of residential properties came into picture. Wagholi is also close to airport, Hadapsar railway station and other renowned educational institutes and thus emerged as a preferred residential destination. Property prices at Wagholi are much lower as compared to other areas like Viman Nagar, Kharadi, and Kalyani Nagar which are near to it, thus making it a first choice for many individuals. It comes under South-West corridor of Pune and is mainly gaining developer’s attention because of weekend destination spots. This area is famous for beautiful lakes, dams like Khadakwasala, Panshet and Mulshi. Many luxurious villa projects are planned in this corridor and are mainly developing from recreation point of view. It has excellent connectivity with central Pune and is close to well developed areas like Bavdhan, Kothrud and Chandni Chowk. From last few years, investment activities have been observed in this area along with nearby locations like Manas Lake on Pirangut Road. Many investors are also taking interest for infrastructural development. This area is close to IT sector of Magarpatta and industrial units at Hadapsar. Due to overcrowding in areas like Wanowrie, Kondhwa and NIBM Road, people are looking for properties in this corridor. This location is also preferred by people working in camp areas. As property rates are very high in Pune, many people give importance to budget rather than location. This sub-market is also in demand by the people already living in Wanowrie, Kondhwa and Fatimanagar for upgrading their flats in Pune at a lower cost. It is also a good area for investment purpose, as one can take his second home at much reasonable rate. So these three corridors are in great demand because of comparatively affordable rates, good connectivity and proximity to most of the IT companies. Pune continued to have infrastructural development even in 2015. Real estate companies have a good control over the residential projects. With availability of lands in various corridors of city, it is offering many options for homebuyers as well as for investors. Pune being a preferred city with its development in IT and other sectors like manufacturing, education and so on, many people look for luxury homes thereby increasing appreciation rate over a period of time. These luxurious houses include 4-5 bhk flats, stylish penthouses etc. Various projects are emerging in areas like Wakad, Pimple Saudagar, Kharadi, Wagholi etc. because of good connectivity with city hotspots and immediacy to schools, colleges and entertainment sectors. Like any other city, the residential market in Pune is reaching its maximum momentum in most of the areas. While localities in the heart of the city are on the verge of saturation, most of the suburbs are growing at a good pace. The reason behind selection of outskirt home for living is mainly due to price, attractiveness and infrastructure. Many investors are offering luxurious flats at an affordable cost, situated at the outskirts of city. Apart from luxurious houses, many buyers are finding low budget flats from investment viewpoint. Hence from the above data, we can say that in 2015, real estate market of Pune was doing well. Inflation including house price component has come to lowest level and it is the good time for property buyers to invest. Rajesh is having five years of experience in the Real estate industry. He is the property adviser by procession. He would love to write his own experience.